The idea for the PAS House was to create a fully hybrid structure, finding the middle ground between a house and a skate park. As opposed to simply placing skateboarding elements inside a domestic environment or installing furniture inside a skate park, the notions behind the PAS House are fully integrated with the architecture. Conceptually, the house functions as a ribbon that creates a continuous surface to be skated from the exterior to the interior. The house is then divided into three separate spaces: a public area with living room, dining, and kitchen; a private zone with bedroom and bath; and a dedicated area for skateboard practice. Each space is fully skateable, as the ground becomes the wall, then ceiling, in a continuous surface that forms a tube, 10ft. in diameter, referencing fluidity in design. Even the furniture is skateable, whether it is integrated into the curve, as it is in the sitting area, or a freestanding object such as the kitchen dining table. Closets and drawers could be integrated in the curve as well. The PAS house is the first house to be entirely used for skateboarding as well as being a traditional dwelling. 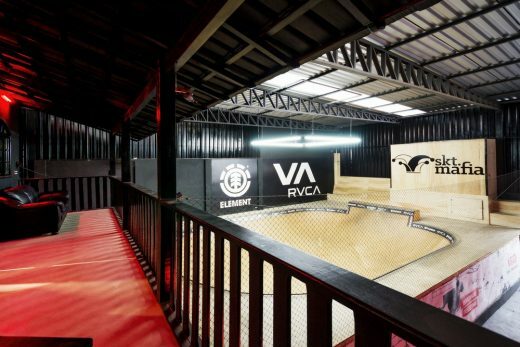 It is the ultimate place for generations of skateboarders who have dreamed of bringing their practice into their homes. In the realm of architecture, it also represents a groundbreaking moment: the construction of a non-Euclidian geometrical space with a continuous surface that creates a new experience of the domestic space, one that is more fluid and dynamic than ever before, and reflective of our 21st century lifestyle. Sustainable facts: The project through his design and its location on the site will make the most of the natural elements (sun exposure and natural ventilation) to avoid the use of air conditioning or heating, all the rest of energy use will come from solar and wind power. Rainwater will be stored and recycled on site for landscaping. The concrete slabs will act as thermal mass and most of the materials, especially the wood, will come from a local source. The prototype in Paris was made using local wood (pine, poplar and birch) and created minimal waste by an efficient use of the plywood panels. The design for the SKT.Mafia store creates an ideal space for the skateboarding scene.